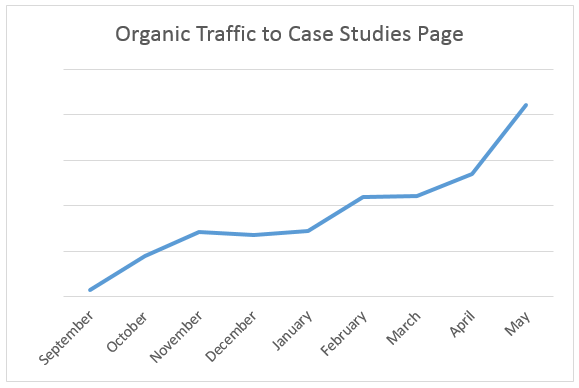 Increase organic traffic to Juniper Networks’ case studies page. As PDFs, the case studies weren’t showing up well in search results and ranked poorly in search results pages. Juniper also had no way of determining which case studies customers were actually reading or how effective they were at assisting in conversions. Obility advised Juniper to move from PDF to web-based case studies, and optimize each case study page for SEO. For each case study, Obility conducted keyword research around the topic to figure out which terms people were most often searching for, and optimized title tags, meta descriptions, H1 tags, and content, etc. accordingly. As Juniper produces new case studies moving forward, Obility conducts the same keyword research to optimize for search results and organic traffic. When we started this project in September 2013, the only thing we could measure was the traffic that came to the Juniper Networks’ case studies landing page – we couldn’t measure traffic to individual Juniper case studies. Now, after transferring the case studies from PDFs to web pages, Obility can determine the traffic for each individual case study, and which ones are proving to be the most valuable in assisting goal conversions reported in Google Analytics goal tracking.